Dr. Patti, as she's affectionately known, is a very special veterinarian, and individual, who needs assistance with medical bill and expenses as she recovers from an injury. As a self-employed traveling veterinarian who specializes in canine sports medicine, rehab and recovery, Dr. Patti has limited health and disability insurance, and minimal financial support. At this point her medical team is telling Dr. Patti that she probably won't be able to drive, or return to work, until December 2015. That's a long period of time for someone who's self-employed to go without income. This page is a plea to everyone who has benefitted from Dr. Patti's knowledge and expertise. Her ability to diagnose, treat and assist the dogs who come to her is amazing. Her talks, seminars and workshops for everyone from pet owners to fellow veterinarians are highly popular and well attended. Her work in the field of canine chiropractic, acupuncture, cold laser and Chinese medicine has helped improve the lives of hundreds of dogs. 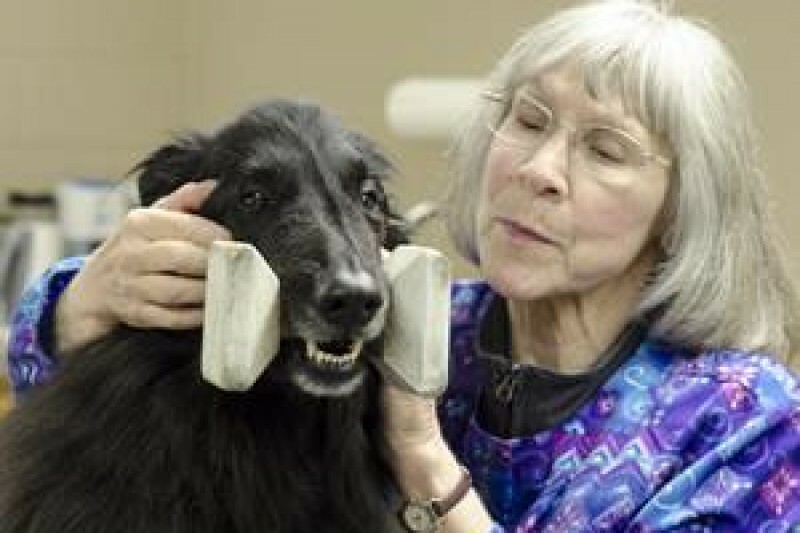 If you'd like to know more about this wonderful veterinarian and her work, follow this link to a feature story about Dr. Patti, written by Ranny Green for the Seattle Kennel Club website in September 2014. Here's the unfortunate chain of events: It started on a Friday in September, when Dr. Patti was treating a new client. During the treatment the dog bit the doctor's hand between her thumb and index finger. It was a painful injury, but was not serious. A few days later, Dr. Patti was practicing her other passion -- canine musical freestyle training -- with her Portuguese Water Dog, Seaquin, and several friends. As Dr. Patti was getting Seaquin out of his kennel in her van, his collar got caught in Dr. Patti's hand -- in the exact place where she had been bitten. As Dr. Patti screamed in pain, a friend reached in to help not knowing Dr. Patti's hand was still caught in Seaquin's collar. Dr. Patti fell to the ground and the gravel parking lot hit her hip in exactly the wrong place. Her right hip was broken. Dr. Patti was transported to the hospital and had surgery shortly thereafter. Because of the location and severity of the break, Dr. Patti's rehab and recovery is going to take several months. Her insurance will not pay all of her expenses. Like all of us who are dog lovers, Dr. Patti's initial primary concern was for her dog. Friends were able to place Seaquin in a boarding kennel until Dr. Patti is well enough to care for him again. Whatever amount you can donate will be appreciated more than you will ever know. Dr. Patti is one of those special people who has helped others her entire life; now it's our turn to help her. Over the past many years Dr. Patti has treated my personal dogs, as well as the dogs of many of our students and clients when she sees patients at our facility twice a month. We all miss her very much and want to have her back soon! I had my first outpatient physical therapy appointment this week. I'll be able to progress much better being able to use equipment compared to what the in home therapists could do. My leg is still very weak but I've been given the go ahead to weight bear as tolerated. Hopefully in another month I'll be able to walk with just a cane. Again, I want to thank everyone for their kind words and generosity. I am so grateful to everyone for the kind words and donations. The therapists think I am right on track in the healing process however I don't think I can bring Seaquin home until I'm pretty solid on the leg. Thank you all again. I just learned about your injuries so missed precious times to help. I'll get in touch ASAP (tomorrow) and find a way to lend a hand. Take care. Miss you, Patti. Hoping you are feeling like yourself again soon. Dr. Patti - Frank and I miss you and hope you feel better soon!